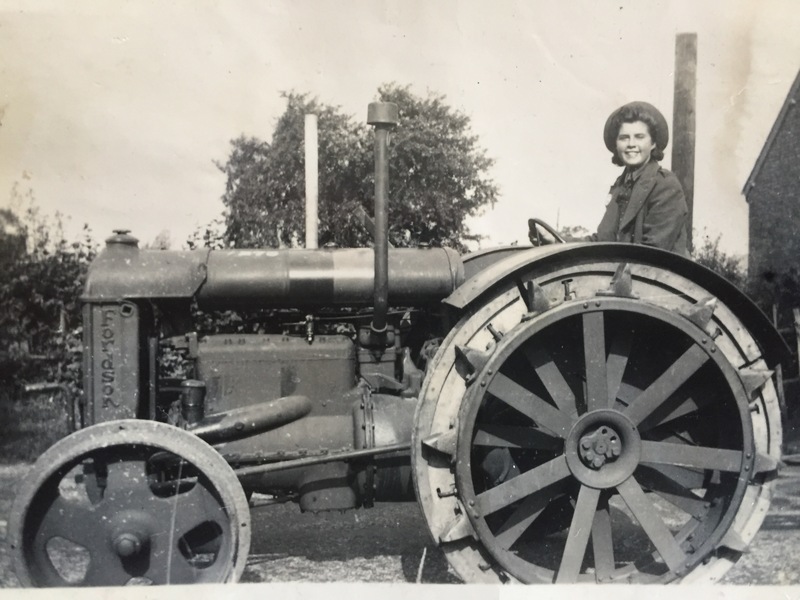 Many thanks to Pamela Bleazard for sending her mother-in-law’s memories of her time in the Women’s Land Army. At the age of 17 I was driving around the villages of Kent in my own tractor, enjoying the freedom and independence of being in the Women’s Land Army. It was 1942, and I enlisted to escape Canterbury after the terrible bombing in which many people were killed, including two of the nurses from the hospital where I had previously worked. They had gone out to a tea-room in the city and never returned for their shift that evening. 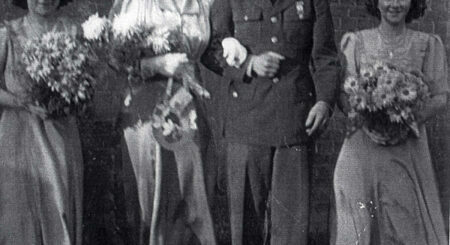 I enlisted as a land girl with a friend when I was 16 in 1941. I remember I didn’t even have to get my parents’ permission! We were sent to Plumpton near Lewes for our six-week assessment and training, during which we were tested out on various aspects of farming during the day and sat through films and lectures during the evening. I remember helping to hold down the cows for the bull’s visit while attempting dairy farming and deciding this was not for me, but I enjoyed learning to drive a tractor and understanding some of the mechanics, such as how to change a gasket. It seemed second nature to sit up in the driving seat, steering in a straight line or learning to pull a trailer. There were road bands to fix around the rubber wheels so that the tractor could be driven along tarmaced roads, and we had to understand the difference in types of fuel. When I was working in the fields my tractor ran on TVO (tractor vapourising oil), but petrol was used to start the engine and warm it up. My main job was to help with flax pulling. Flax was essential to the war effort as it was used in parachute harnesses and the seed was made into linseed oil, so I drove around to farms all over mid-Kent from Pluckley to Cudham, wherever I was needed. The flax was taken to the English Flax Company factory in Pluckley. There it was pressed through rollers and separated into strands ready to be woven into material and the seeds made into oil. I was part of a busy process which was hard work but never seemed dull. 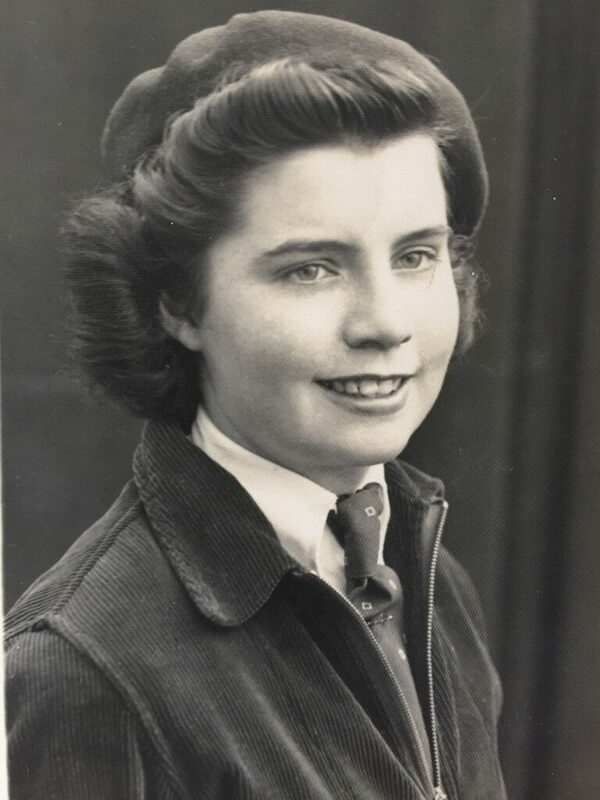 I was chosen to be one of 2 land-girls who were picked to work in the factory full-time after the harvest was over. 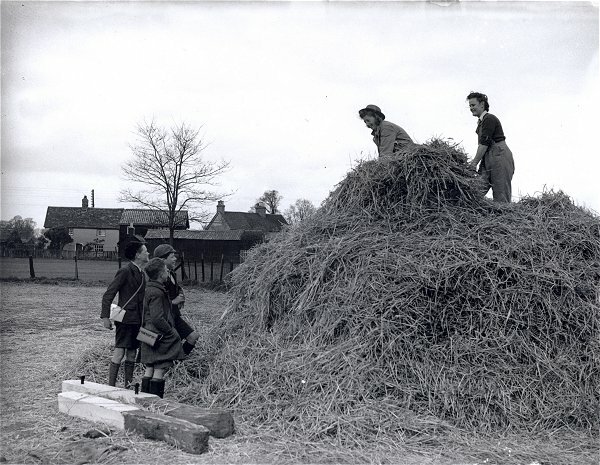 We had to collect the stooks of flax which lorries had brought to the factory to be stored in great Dutch barns, and then drive our load exactly under the elevator. It was a tricky procedure backing in a four wheel trailer to get it in just the right place. In the factory I used a rubber-tyred tractor which ran on petrol only as it had to stop and start quite often. Once the flax had been processed by the machines in the factory we then had to transport it to Pluckley Station. The best part for me was harvest time in the summer: I loved the freedom of travelling through the country lanes to my next job as the Kent countryside was so beautiful, and I loved being in the open air. I boarded in the village of Egerton, but during the harvest stayed on the farms where I was working. Tasks and billets were assigned by the Crops Officer, who would meet me regularly and tell me where I would be stationed next. By day I arrived at a farm, took the road bands off my tractor and then drove up and down the fields in straight lines, with a machine behind my tractor the machine which pulled the flax out of the ground and tied it in sheaves. I had to take care at the corners to reverse and cover the whole field. It was mainly older men and teenagers not yet enlisted who actually gathered the flax sheaves into stooks so that it could be collected by lorries which would take it to the factory. There was some banter and a little flirting. One young boy became so besotted with me that he sent a box of apples to my home every year for some time after I left his farm. From week to week I never knew exactly where I would end up, and that was part of the fun of the job. I remember my Crops Officer asking me if I had any nice frocks as I would be staying with a farmer called Mr Freeman (of Freeman, Hardy and Willis, the shoe company) and the family expected me to dress for dinner. Wherever I was billeted, the farmer usually treated me as one of the family, so we all ate together at the end of the day, with better food than I would have had in the hospital digs. Although the farmers had to give up their produce for the war effort, no-one could count the number of eggs a chicken laid nor the apples on a tree. There was always fresh butter and milk, and I can still remember home-made lemonade brought out to the fields when I was so thirsty on a hot dusty day. Sometimes the farmers would shoot the rabbits which were exposed in the fields when the flax was pulled. Although I didn’t enjoy skinning and paunching them, they made tasty meals! Even better than the food, on rare occasions there was a hot bath, and a chance to dress up for a dance in one of the parish halls. At that time of the war there were large numbers of enlisted men billeted in that part of Kent, so It was a great time to be young and female! I don’t think I would have had the same freedom and independence living at home, but the demands of the work helped me learn to look after myself. Looking back, I can’t remember any grey rainy days. The sun always seemed to be shining, which seems ironic now as we were going through some of the darkest days of the war.